To understand an Excel chat well, I will advise you to know the Excel chart elements very well. It is very important to be introduced to the parts of charts in Excel. This article will give you the full guide. To introduce you to the different parts of an Excel chart, I have used the following data table. I shall use this sample data to make a combo chart. I am going to explain how to create this type of chart. 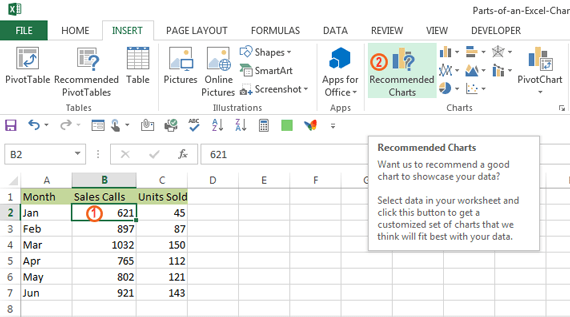 Click any cell within the data zone. 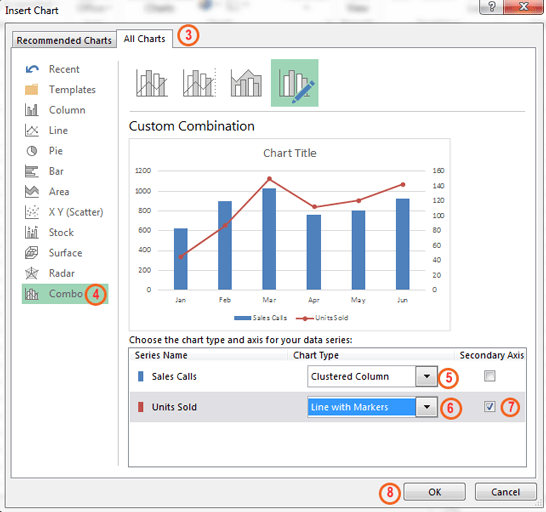 Activate All Charts tab of Insert Chart dialog box. Select Combo from the left side options. 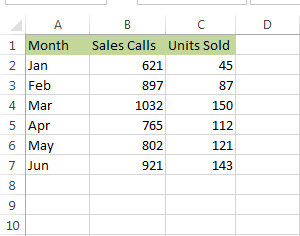 I have chosen Clustered Column chart type for Sales Calls data series. And chosen Line with Markers chart type for Units Sold data series. I want to make Units Sold as the secondary axis. Then click OK. Insert Chart dialog box disappears. We shall get a chart like this. This raw chart I am getting now. Let’s polish it some other tools. Click on the CHART ELEMENTS icon (“+” sign icon) from the top-right corner of the chart. A shortcut menu appears. Hover the mouse over Data Label option from the list. Don’t click it. A little right-arrow icon appears, click on this icon. Another shortcut menu appears. Choose More Options… option from this list. Adding Data Label to a chart. Deselect Value option from the LABEL OPTIONS. So the chart looks like this one. Select Axis Titles option from the shortcut menu. Three Axis Title fields will appear in the relevant axes. Axis Title Change of the chart. Double Click on every Axis title to get the Edit mode (in Edit mode, you can change the name of the Axis), change the name of the Axis Title and then change the format of Axis title like the following figure. Finally, I get the chart like this one. 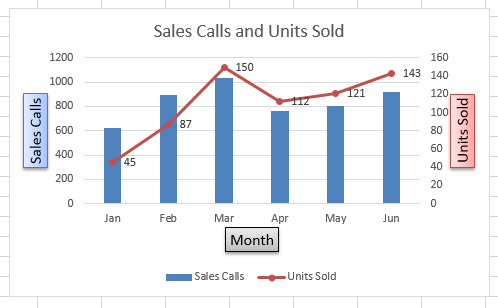 This Chart has two data series: Sales Calls and Units Sold. 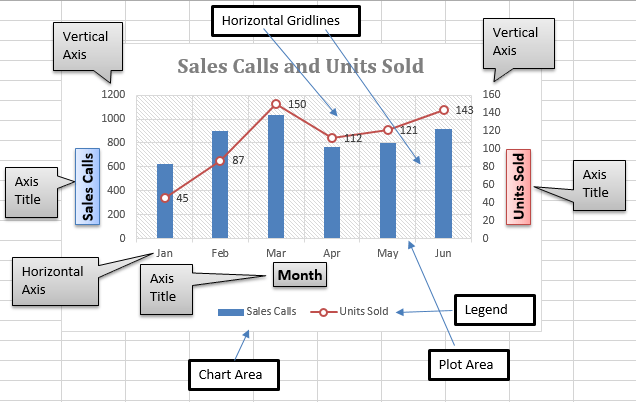 To plot Sales Calls, I have used vertical columns (Clustered Column Chart) and to plot the Units Sold I have used Stacked Line Chart with Markers. The chart data is placed in the cell range A1: C7. This chart has a horizontal axis. The horizontal axis is known as the category axis. This axis holds the Month column information. It has two vertical axes. Vertical axes are known as value axes. Each axis has a different scale. 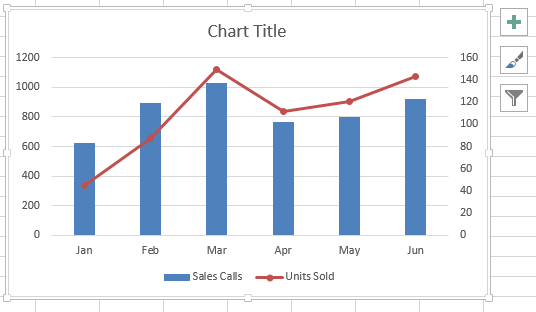 The left axis holds Sales Calls data series, and the axis on the right side holds the Units Sold data series. The value axes also display scale values. Left vertical axis shows scale values from 0 to 1,200, incremented by 200. The right vertical axis uses a different scale: 0 to 160, incremented by 20. A question may arise: why two value axes? The chart uses two values axes as the two data series vary dramatically in scale. If we used the same scale to plot the chart, the line would barely be visible. Using Legend, we identify the data series or data points in the chart. In this chart example, the legend appears on the bottom of the chart. In this chart Data Labels(45, 87, 150 and so on) are showed only for Units Sold data series. Data Labels for Sales Calls are not showed in this chart. 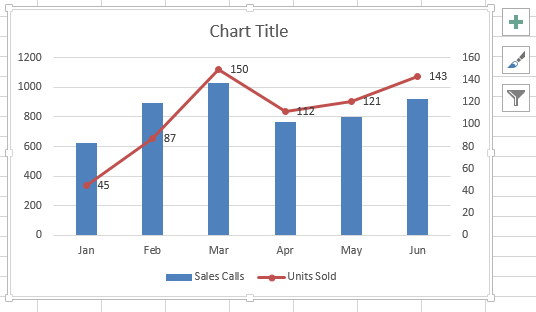 In our chart, Chart title is Sales Calls and Units Sold showed in the top-middle of the chart area. Horizontal Grid lines are extensions of the value axis. Horizontal grid lines make it easier for the chart reader to determine the magnitude of the data points. The entire background of the chart is Chart Area, only the actual chart area is called Plot area. These two are marked in the above chart. Plot area has a different color in the above image, not necessarily that all plot area will have a different color. 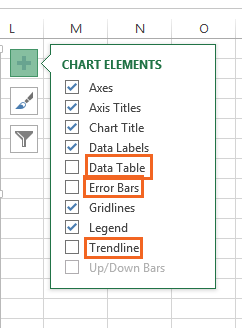 You can also add a trend line to your chart from the Chart Elements(top-right corner of the chart, shown when the chart is activated). You can display error bars in your chart. Data Table also can be shown in the chart. Trend Line, Error Bars, and Data Table also can be added to your chart. So, this was all from me on this topic. Let me know in case you face any issues while using this article. Thank you for reading.